One day, about three weeks ago, I was sitting in my home studio drinking coffee and staring into space. I was listening to some music on my iPad (which I had just recently started using again, it having had been unavailable for the last few months). While I sat there, my eyes drifted to my bookcase, and somehow found my copy of 'Painting Nature's Quiet Places' by Thomas Aquinas Daly. I started to think about how much I love Daly's work, and presently I brought the book down from the shelf and began reading it again. I have attempted to emulate Daly in my own watercolours many times, but the specifics of his style and technique remains a mystery to me (him being a modern day watercolour master and all). It was while pondering his style that I began to speculate about his palette and the paints he used, something I have pondered many times before. Suddenly, I decided I wanted to understand his palette, and being a paint pigment nerd I made a list of Daly's paints, researched the colours and then laid them out on a colour wheel, in the fashion of the handprint artist palettes. Daly's traditional paint choices form a somewhat subdued split primary palette.While I couldn't quite find an artist whose palette is as constrained, Michael Rocco comes closest, with both choosing 16 paints developed around the "primary" triad footprint. Luckily, I have old Winsor and Newton catalogues. In recent years Winsor and Newton have reformulated Light Red and Davy's Gray, and discontinued Warm Sepia (amongst others). A minor brand revision occurred in 1995 or so, and a major revision occurred in 2005. The changed paints that feature in the Daly palette have undergone minor change, none were fugitive or unstable to begin with. The Light Red is now brighter, the Davy's Gray is now semi-transparent due to the removal of the white which made it opaque, and they suggest adding Burnt Sienna to Sepia to approximate the colour of the old paint (Warm Sepia). I substituted M Graham for Winsor and Newton's Cadmium Yellow, Cadmium Orange, and Cadmium Red. 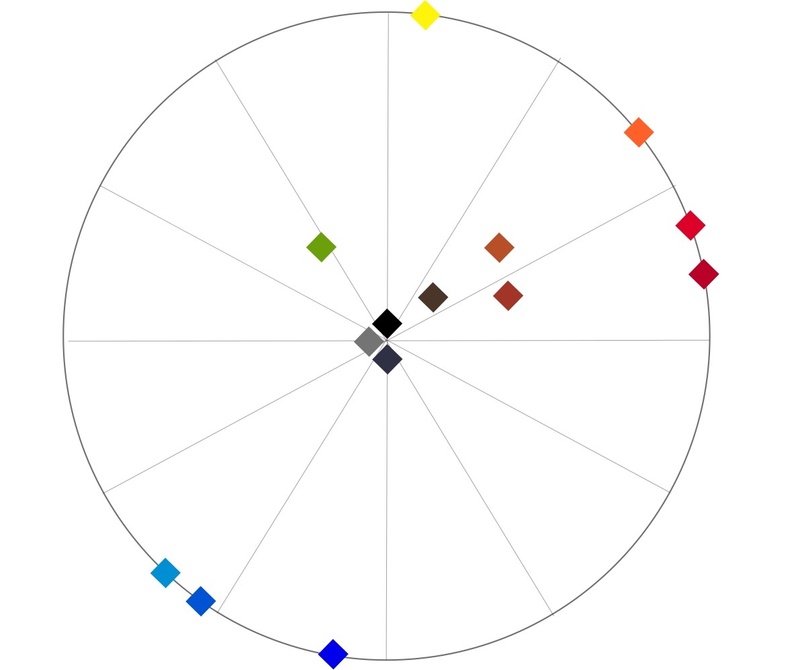 Alizarin Crimson, French Ultramarine, Ivory Black, and Prussian Blue were also substituted for their M Graham equivalents - all paints being matched pigment for pigment - ditto for Holbein's Cerulean Blue. Next, I ordered Winsor and Newton's Davy's Gray, Payne's Gray, Burnt Sienna, Light Red, and Olive Green. Winsor and Newton's Olive Green (PY42,PG7) surprised me - it is a lovely paint, and I had nothing like it in my collection of 230+ tubes. I have included Alizarin Crimson, PR83, a fugitive pigment. I don't sell my work and this is not my everyday palette, so I'll enjoy Alizarin Crimson for what it is. The Paintbox, 16 full pans.